The opposing groups had merged during the rally outside the Supreme Court Justice building. 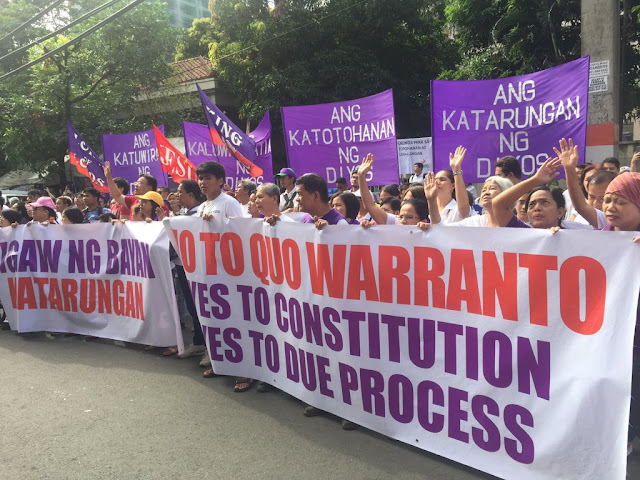 The Pro and Anti Sereno protesters met in the vicinity of the high court in the Philippines to witness the rise or fall of Supreme Court Chief Justice Maria Lourdes Sereno. In the Battle outside, as the crowd gets denser and bullies more shouter, the En banc session with 14 Associated Justices had come to the decision to finally end the term of office of the Chief Justice. With 9-5 votes in favor to Sereno to became the Ex-Chief Justice of the Supreme Court in the Philippines is now final and executory, ordering her to leave the office immediately. The supporters of each sides has witness the first time happened in the country to an impeachable official being removed to the office by Quo Warranto case as she was the first female served as Chief Justice.